Options Multi-solution effectively disinfects, cleans, and lubricates soft contact lenses. Its composition is highly similar to that of human tears, so it's gentle enough for sensitive eyes. Each bottle comes with a lens case. Options Multi Solution is a new product by CooperVision. 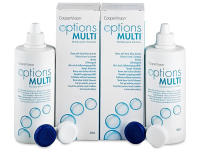 Options Multi has an exceptional disinfecting, cleaning, and lubricating efficiency, and its ingredients are uniquely similar to human tears. As a result, it is gentle on even the most sensitive eyes. This package contains two 360 ml bottles with two lens cases. Use within 90 days of first opening the bottle.